One of the reasons we love Switzerland so much is the wonderful way you hardly need to plan anything and yet with the efficiency of the Swiss transport system it all works like a Swiss watch with precision timing. We had a perfect example of this on our recent stay at Weggis on Lake Lucerne. We decided to set off for a lazy day trip over to one of our favourite places Thun, perhaps not as well known as some of the other Swiss towns and ski resorts but a lovely place with a wonderful Altstadt and an imposing castle on the hill. We figured we’d have lunch at one of the many chic little cafes and restaurants overlooking the River Aare. On this particular day we opted to take the short ride from Weggis into Lucerne by bus and train though we could just have easily waited for the next boat. Following seamless rail connections from Lucerne via Bern we emerged from Thun Station a couple of hours later in time for lunch. Monsieur Le Chic spied a boat docked at the nearby Quay scheduled to depart for Interlaken Ost 10 minutes later. 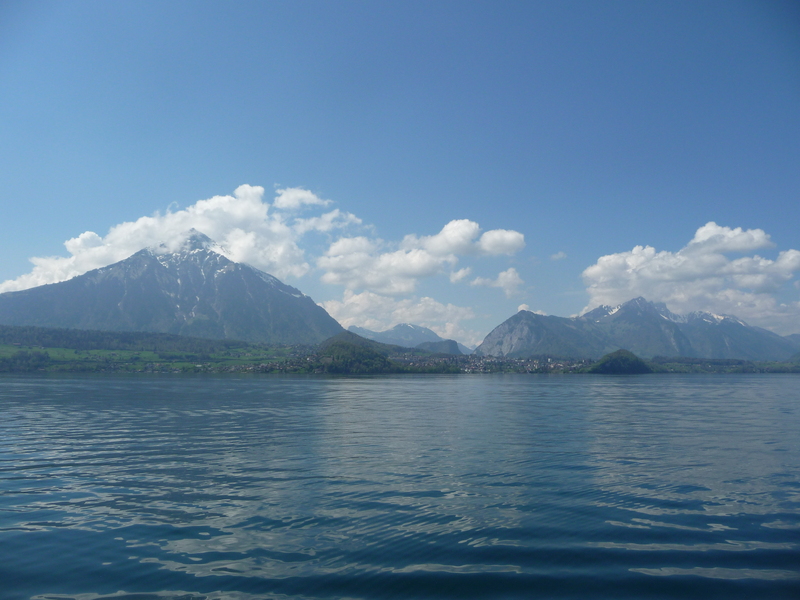 We’d never cruised on Thunersee before although we’d ridden along by the side of the lake in trains many times and admired the wonderful views. Why not let’s go for a boat trip instead? It’s hard to put into words what a magnificent experience the next couple of hours were. Fortified with a superb meal on board we sailed along the lake on a beautiful warm spring day relaxing and soaking in the atmosphere. We were surrounded by snow capped mountains, water glistening in the sun and clear blue skies. We continued in this idyllic fashion until we came into Interlaken West. I decided to hop off and take some photos as the boat had been moored for some time and the crew did not seem in a hurry to get going. Aha…a large concrete wall was situated between the front of the boat and the direction of Interlaken Ost – clearly we were supposed to have taken the short ride from Interlaken West to Ost by train. Hurrying back to wake Monsieur Le Chic from his sundeck snoozing lest the boat should depart again for Thun with us still on board, we scuttled off into the adjacent railway station to discover that this of course being Switzerland the connection to the Ost Bahnhof had been meticulously timed to connect with the boat and we would have to wait 40 minutes for the next one. Nestling in the shade in one corner of the car park were 3 horse drawn carriages and their drivers. Undaunted Monsieur Le Chic suggested we take a tour of the town. I was a little anxious as our time schedule was tight but after all we were in Switzerland and timing is exact. Our amiable driver took us on a delightful 30 minute tour of the town pointing out the sites and the buildings of the Old Town and had us back at the station precisely 30 minutes later as promised. Off we duly departed. On the short train ride from West to Ost we caught sight of a little mountain railway at the side of the railway line. Would this be worth exploring we wondered? 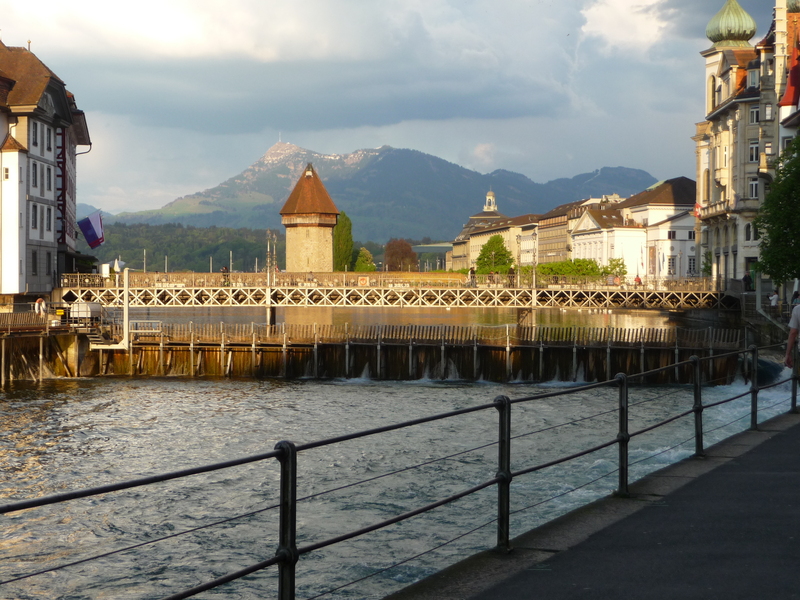 Our only commitment was a booking at our favourite restaurant in Lucerne at 7.30pm. So off we went to investigate and found that the funicular railway was called the Harderbahn and went up and down to the mountain summit, the Harder Kulm, taking precisely 8 minutes up the mountain and 8 minutes down. More importantly it was open and running for business (fortuitously we were there in April just 5 days after the funicular reopened for this year’s summer season). A short walk along a pathway at the top and there we were at the Harder Kulm Lookout. Perfectly situated between Lake Thun and Lake Brienz, you get the most wonderful panoramic views of the entire Bernese Oberland..magnifique! It was one of those places that you never want to leave. We were blessed with the most divine weather and sat admiring the view from the terrace of the Bergrestaurant enjoying ice creams and drinks without a care in the world. 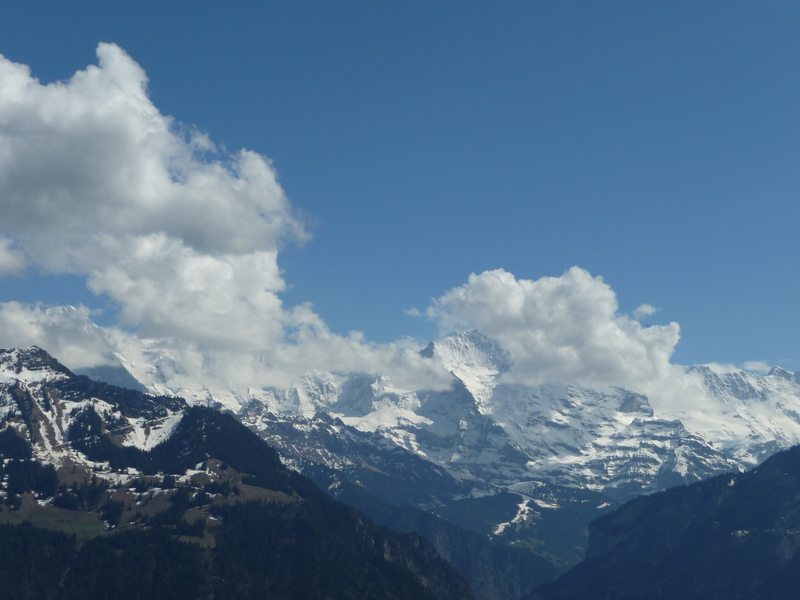 This is a little corner of “Heaven On Earth” that certainly does not get as much publicity as its better known neighbours in the Interlaken area such as the Jungfrau but is well worth the short detour from the popular tourist trail up to Jungfraujoch. There are lots of recommended walking paths around the Harder Kulm area and we noticed several families bringing their dogs along for the ride too (who must have been locals). Vowing to return some day we retraced our steps, caught the Golden Pass train over the Brunig pass and back down the other side to arrive in Lucerne in perfect time for a wonderful meal at Nix In Der Laterne (which warrants a post in itself!). As we sat enjoying aperitifs by the side of the River Reuss, Mother Nature put on one last show for us that day in the form of a spectacular thunderstorm (we moved indoors before it fully hit!). It had been a truly serendipitous day one we hadn’t planned but we just kept on following our instincts and luck along with Swiss efficiency did the rest. Brings back memories of a marvellous day. I was so relaxed during the boat ride that if you hadn’t woken me up, we would have been halfway back to Thun before we knew it. When travelling in Switzerland, it is nearly always possible to rely on the transport system to do what it says it will, unlike other European places like, say, Italy. The unexpected experiences, when you back your judgment to go on the lake or up a mountain, are often the most enjoyable. I prefer the independent travelling rather than having too fixed a plan or feeling obligated to visit a specific set of tourist attractions.